The world of advertising is a cut throat world, the strong survive and the weak are left behind. Microsoft has reached out to the popular History Channel show, Pawn Stars for their "Scroogled" campaign. More and more we have seen commercials move from subtle attacks on the competition, to blatant nukes. These attacks go from radio commercials all the way to press conferences. Recently, during a press conference series called "Bold Moves", brought to us by T-Mobile, we saw a off the leash version of CEO John Legere attack AT&T. Legere used the popular AT&T commercial where they ask kids simple questions to lead them to an adult decision. Legere had a scene set on stage with dolls, sitting in chairs and asked them simple questions, mocking the commercial. Legere isn't the only one using these tactics. More recently, Verizon Wireless, has released some very artistic commercials. These commercials brought people into an art gallery, where they used the coverage maps of all providers and asked, "What do you see?". In the end, people could only tell they were looking at a coverage map, after seeing the Verizon version. Now, we have Microsoft attacking Google in an interesting fashion. 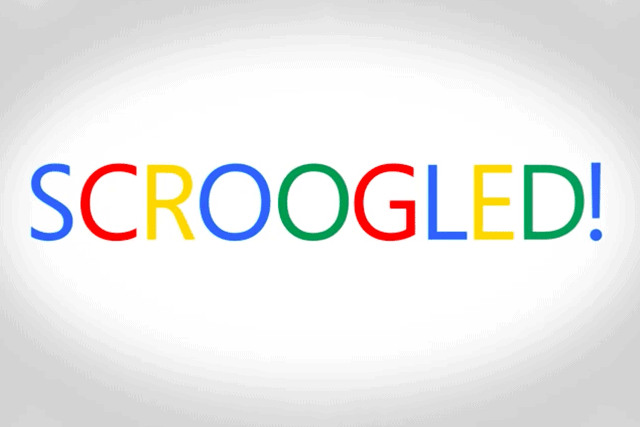 Microsoft brings us "Scoroogled", an ad campaign with the sole intent to attack Google. More specifically than that, they have targeted the Google Chromebook. In the advertisement, they have a woman trying to make it to Hollywood California. In order to get there, she wants to sell her Google Chromebook, to get the money for a ticket to Hollywood. Staying true to the Pawn Star's fashion, she brings in the chromebook and explains what she intends to do, only to get laughs from the one of the stars, Rick Harris. Harris goes onto to the viewers, in a confessional style back room, that the Chromebook is basically a brick unless connected to the internet. If you own a Chromebook, you probably are familiar with the offline mode, but this is advertising, and they hope to take advantage of the less informed. Now to continue the commercial, Harris informs the woman that he isn't interested in buying the Chromebook, because it has the Chrome logo, which means its "not a laptop". In the same confessional back room, Harris tells us that a traditional laptop, "utilizes built in applications like Office..." So I guess its not a laptop without Microsoft Word, even though the Chromebook does have Google Docs, which I am using to write this article now. Microsoft also takes this chance to tell you how much like "the man" google is. Harris informs us that when we are online, Google is tracking "what you do to sell ads." Thats where he shows off the use of the word "Scroogled". To be "Scroogled", is to be used to make money by Google, or at least thats what you are led to believe. Overall the commercial is funny to watch, though, it is not the whole truth. We have to remember, the world of advertising is cut throat, and some choose to attack in this manner.